Every year hopes and expectations are high in breeding sheds around the world with the biggest weight placed on stallions with first foals are arriving. While there are 11 months until breeders can first see how the foals are received by buyers at the winter breeding stock sales, how first foals look in the first few months of the year can affect a sire’s book in his second breeding season. Over 145 stallions in North America are listed on Blood-Horse as entering stud in 2016 in a strong year of new recruits. Here are 11 stallions whose foals breeders and fans should look out for this year. The star of the new sires this year is obviously American Pharoah (Pioneerof the Nile), the first Triple Crown winner in 37 years. 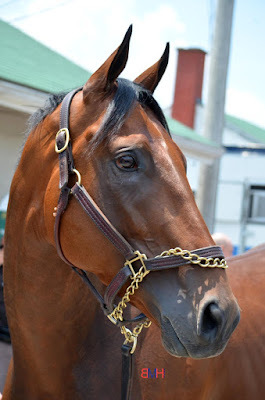 Named Champion 3-Year-Old and Horse of the Year in 2015, American Pharoah stood his first season for $200,000 and covered a book of 208 mares that included some of the best broodmares in the sport with the foals from that first covering season starting to arrive on Jan. 2. American Pharoah will be standing his second season at Coolmore’s Kentucky branch for a private fee in 2017. The 2014 Breeders’ Cup Classic winning Bayern (Offlee Wild) joins those who have first foals this year. A dual-Grade 1 winner with his Classic and William Hill Haskell Invitational Stakes victories, Bayern won six of his 15 starts with four other on the board finishes including in the Grade 1 Arkansas Derby and Grade 1 Awesome Again. Bayern bred 139 mares in 2016 at a fee of $15,000, the same fee he’ll stand at this year for his second season at Hill ‘n’ Dale Farm in Lexington, Ky.
Two-time Grade 1 winner Carpe Diem (Giant’s Causeway) proved to be a popular freshman sire for WinStar Farm last year when covering 162 mares. Carpe Diem was the winner of four races in his career, including the aforementioned Grade 1s and the Grade 2 Tampa Bay Derby. He also finished second to Texas Red in the Grade 1 Sentient Jet Breeders’ Cup Juvenile at Santa Anita in 2014. In all, he won four of six starts and finished second in another for over $1.5 million in earnings. He’ll be standing his second season at WinStar this year for $25,000. Part of an extremely active family, Fast Anna (Medaglia d’Oro) is out of champion Dreaming of Anna, whose sire Rahy stood at the same farm as her son. One of two new stallions for Three Chimneys Farm last year, Fast Anna covered 120 mares. He won three of nine starts in his two year career, including the Sawgrass Handicap and was Grade 1 placed behind The Big Beast (Yes It's True) in the Grade 1 Ketel One King’s Bishop. He’ll be standing for $7,500 in 2017. The Champion Older Dirt Male the year he retired, Honor Code (A.P. Indy) retired to Lane’s End Farm in 2016 with hopes of becoming his sire’s heir. Showing promise as a 2-year-old, Honor Code won the Grade 2 Remsen over Cairo Prince (Pioneerof the Nile) and was second in the Grade 1 Foxwoods Champagne Stakes to Havana that year but suffered an injury as a 3-year-old that kept him off the track most of his 3-year-old season. At four, Honor Code lived up to his 2-year-old promise when winning two Grade 1 races and one Grade 2 in addition to finishing third in the Breeders’ Cup Classic. Honor Code bred 144 mares in his first season at stud when standing for $40,000, the same fee he is at this year. Bred to appeal to a worldwide group of breeders and with a race record to match, Breeders’ Cup Mile winner Karakontie (Bernstein) bred 113 mares at Gainesway Farm in 2016.The Japanese-born Karakontie was based in France throughout his career and won five of 12 starts including the Grade 1 Qatar Prix Jean Luc Lagardere Grand Criterium and Poule d’Essai des Poulains. His third dam is the great Miesque, who has quickly developed an important pedigree branch in Thoroughbreds and his dam has followed her lead with three stakes winners, including one interestingly by Lemon Drop Kid who is by Miesque’s son Kingmambo. Karakontie enters his second season at a $15,000 fee. One of the final big sons to hit the shed by Unbridled’s Song, Liam’s Map was one of four new stallions for Lane’s End Farm in 2016. Beginning his career at 3 years old, Liam’s Map won that year’s Harlan’s Holiday but his 4-year-old year was where he shined. The colt won the Grade 1 Woodward Stakes at Saratoga, finished second to fellow Lane’s End stallion Honor Code in the Grade 1 Whitney Stakes then took the smarter route at the Breeders’ Cup by going into and winning the Grade 1 Las Vegas Dirt Mile. He bred 148 mares last year at Lane’s End and currently stands for a fee of $25,000. One of three Grade 1 Belmont Stakes winners and the first major Curlin son to retire, Palace Malice was a major coup for Three Chimney Farm when it bought into him during his racing career. Curlin’s first graded stakes winner, Palace Malice was both the Belmont and the Grade 2 Jim Dandy at three in addition to being second in two other Grade 1s that year. At four, he defeated a Grade 1 Metropolitan Handicap field that included two-time Grade 1 Breeders’ Cup Dirt Mile winner Goldencents (Into Mischief) among three other graded stakes wins. Palace Malice proved to be popular last year when breeding 158 mares, more than the 141 his sire received (albeit at a much lower fee). He currently stands for a fee of $20,000. A two-time Breeders’ Cup winner, Secret Circle (Eddington) stands next to fellow Breeders’ Cup winners Bayern, Curlin (Smart Strike) and New Year’s Day (Street Cry) at Hill ‘n’ Dale Farm. Racing for five years, Secret Circle hit the board in 15 of 16 starts with eight victories including the Sentient Jet Breeders’ Cup Juvenile Sprint, the Grade 1 Xpress Bet Breeders’ Cup Sprint and the Grade 1 Dubai Golden Shaheen Sponsored by Gulf News. Secret Circle bred 63 mares in 2016 and stands for a fee of $5,000 this year. Florida-based The Big Beast only raced nine times but made the most of those starts, winning the Grade 1 Ketel One King’s Bishop and finishing second in the Grade 1 Priority One Jets Forego Stakes and Grade 1 Alfred G. Vanderbilt Handicap. One of only four Yes It’s True sons advertised on Stallion Register with 2017 stud fees, The Big Beast bred 103 mares in 2016 at Ocala Stud to be the fourth most popular in the state. This year, The Big Beast again stands in Florida for a fee of $6,000. A winner from a mile to a mile and a half, Tonalist (Tapit) proved to be a versatile horse during his three years on the track. Perhaps the best son of Tapit to enter the shed, Tonalist was a two time winner of the Grade 1 Jockey Club Gold Cup, a winner of the Belmont Stakes and a winner of the Grade 1 Cigar Mile in addition to three other Grade 1 placings in his career. Tonalist’s second dam is Toll Fee (Topsider), the mare responsible for racehorses such as Horse of the Year Havre de Grace (Saint Liam) and multiple Grade 1 winner Riskaverse (Dynaformer). He bred 138 mares last year and again stands for a fee of $30,000 at Lane’s End in 2017. Great stuff as always Melissa. Thanks.